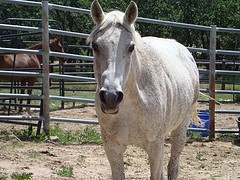 Mia is a seventeen year old Arabian mare. She came to live here in June 2011 after her owner could no longer physically care for her. Mia is our barn princess, having spent a good deal of her life as a show horse. Mia has a beautiful personality, is very smart and loves people.